Plymouth came into the matchup as the two time defending state champs while Alvirne was making its first state title appearance in school history. When we left at halftime Alvirne surprisingly held a small lead over the two time defending state champs from Plymouth. Let’s see which team was able to start off the third quarter with intensity. After the Bobcats from Plymouth Regional High School won New Hampshire’s division 2 football state championship over Alvirne we spoke with a number of Plymouth’s key players to hear their thoughts about the game. 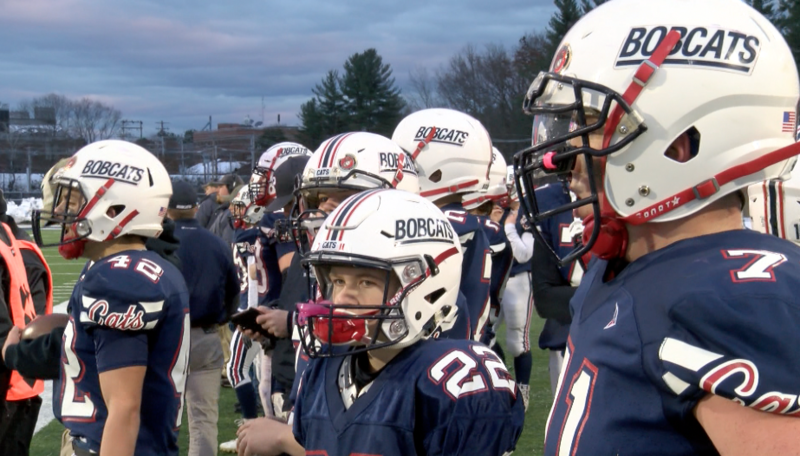 After the Bobcats from Plymouth Regional High School beat the Alvirne Broncos in New Hampshire’s division 2 football state championship, we spoke with Bobcats head coach Chris Sanborn about the game as part of our coaches corner segment brought to you by Bubba’s Bar and Grill.